Everyone likes the term discount and they love it the most when it is unexpected. You tend to get discount's on various festive occasions and year end sales but hardly on a normal day. We don't offer discounts to our customers, but rates charged for our services by us our even lower than the discounted prices you will find anywhere. 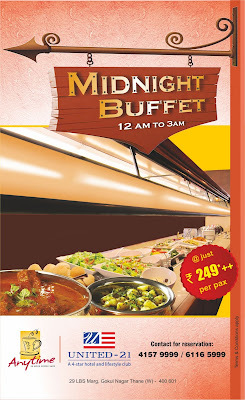 Yes, you read it right, we offer Midnight Buffet at "Anytime" coffee shop from 12.00 am to 3.00 am, everyday. The buffet dinner would cost you just 249* and you could experience having your dinner at one of the most convenient place in town. Along with the Midnight meal, you could even have some variety of our coffee, a strange combination but good enough to try it at least once. So if you are out travelling and need a good place to have dinner late night, we are at the doors welcoming you. We hope you have great time enjoying your dinner at our place. Don't forget to expereince your dinner along with a cup of coffee.